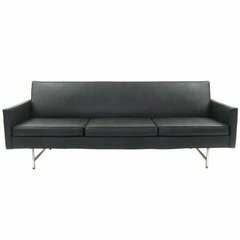 Sorry, Paul McCobb Sectional Sofa for Directional is not currently available. Stunning two-piece sectional sofa designed by Paul McCobb for Directional. Features a solid brass base. Fully restored. 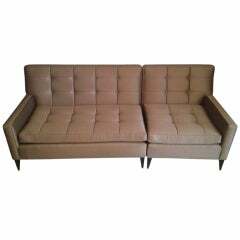 Nice Paul McCobb directional sofa. Brass can be polished or left with patina. Elegant grouping of three brass legs. Waiting for its next close-up! Upholstery services available! 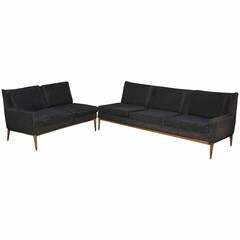 Paul McCobb two pieces sofa with tapered mahogany legs and tufted seat and back. Loveseat section 48" long, chair section 28" wide. Great looking four-seat sofa by Paul McCobb. This comfortable sofa has completely been restored and re-upholstered. 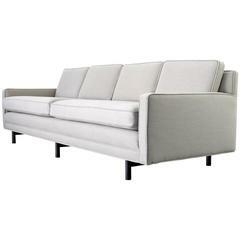 Reupholstered three-seat Paul McCobb designed sofa for the Directional Design line by Sedgefield. Clean lines. Sophisticated.